City Lights Publishers - City Lights Publishe, 9780872865891, 461pp. Upon leaving the White House in 1961, President Eisenhower famously warned Americans about the dangers of a "military industrial complex," and was clearly worried about the destabilizing effects of a national economy based on outsized investments in military spending. As more and more Americans fall into poverty and the global economy spirals downward, the United States is spending more on the military than ever before. What are the consequences and what can be done? Melvin A. Goodman, a twenty-four-year veteran of the CIA, brings peerless authority to his argument that US military spending is indeed making Americans poorer and less secure while undermining our political standing in the world. 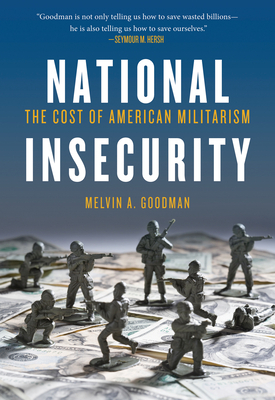 Drawing from his firsthand experience with war planners and intelligence strategists, Goodman offers an insider's critique of the US military economy from President's Eisenhower's farewell warning to Barack Obama's expansion of the military's power. He outlines a much needed vision for how to alter our military policy, practices, and spending in order to better position the United States globally and enhance prosperity and security at home. Melvin A. Goodman is the Director of the National Security Project at the Center for International Policy. A former professor of international security at the National War College and an intelligence adviser to strategic disarmament talks in the 1970s, he is the author of several books, including the critically acclaimed The Failure of Intelligence. Melvin A. Goodman is a senior fellow at the Center for International Policy in Washington, DC and an adjunct professor at Johns Hopkins University. He has been a senior analyst at the CIA and the State Department as well as a professor of international security at the National War College and an intelligence adviser to strategic disarmament talks in the 1970s. He has authored several works, his most recent is the critically acclaimed "The Failure of Intelligence: The Decline and Fall of the CIA"